Under a sky of dense gray clouds, nearly 200 people gathered in Gardner Park — many with brightly colored Mardi Gras beads around their necks. 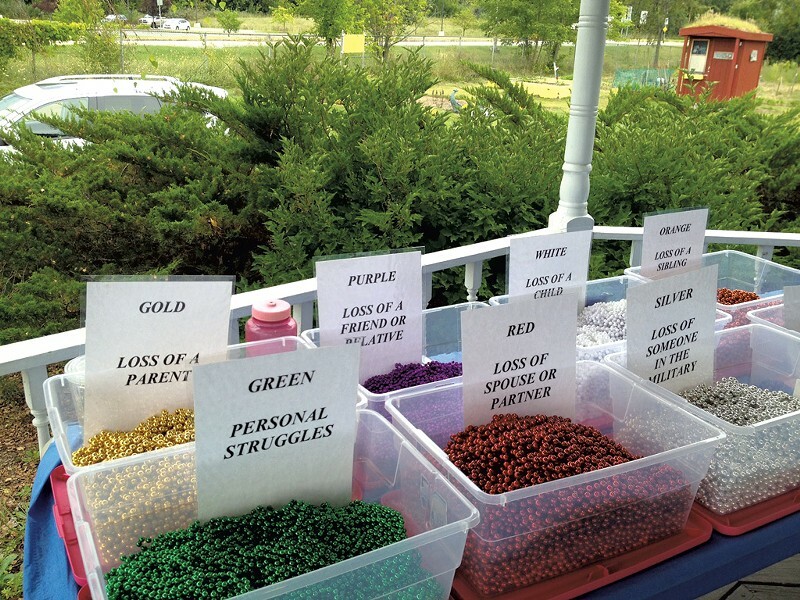 Each color had a distinct purpose: to indicate their relationship to someone lost to suicide. Red for a spouse or partner; white for a child, gold for a parent. Green beads reflected a personal struggle with depression, one of the most common reasons an individual commits suicide. Men, women and children came from across the Northeast Kingdom and beyond for the third annual Out of the Darkness walk in Newport. Marc Bathalon of Monroe, N.H., wore orange beads, signifying the loss of a sibling. He took the microphone beneath a white gazebo before the walk started. Fighting tears, he described the death of his younger brother, John Bathalon, in August 2011, at age 33. An aunt had called him after her police scanner reported a shot fired at John's house. Marc Bathalon was worried that his brother — a contractor, father of three, and avid sportsman and hunter — had been injured while cleaning a gun. When his father reached him by cellphone, Marc Bathalon was already driving to his native Troy, where his brother lived. "All Dad said was that John was gone," Bathalon told the group. His brother had been in a desperate place before, in 2007, but had reached out to his four siblings for help, Marc Bathalon said. The family rallied around him, and he appeared to pull through. Bathalon urged listeners to be alert to friends or family members in trouble. "Don't look the other way," he said. "I wish John could have called me to talk out his issues." The crowd listened intently as Bathalon spoke. Some slipped an arm around a companion. When he was done, the audience clapped steadily. More than a dozen members of the Bathalon family joined Marc Bathalon in the walk, including his brother's three daughters, who now live in Essex. John Bathalon's youngest, Lacey, 8, was honored for raising $350 this year for the cause. His oldest, Taylor, 16, said that participating is important for all of them. "It's hard," Taylor said, surrounded by cousins. But she can see the impact; talking about a death from suicide feels more acceptable now. "It's starting to get better through this walk," she said. That's a goal of the event, said co-organizer Betty Barrett of Newport Center. Barrett wore white and green beads. She lost a 34-year-old son, Michael Narducci, to suicide in 2004. She had already attempted suicide herself and came close again after her son's death. Barrett shied away from speaking about her struggles until recently. "I didn't want people thinking I was crazy. I know the stigma," she said. But now she's convinced that the silence is a big part of the problem, especially among men. "I just want to spread awareness that it's OK to talk about it. You shouldn't be ashamed," she said. The Newport event was born from a simple note from one grieving mother to another. Mary Butler learned about John Bathalon's death after purchasing his house in Troy in late 2011. She soon sent a letter to his mother. "She wrote to me and said, 'I know what you are going through,'" Lillian Bathalon said. Butler had lost both a stepson and a younger brother to suicide. 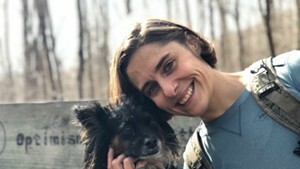 As soon as Butler and Bathalon connected, Butler suggested they both participate in an Out of the Darkness walk in Burlington, with the idea of starting their own in Newport later. Bathalon proposed they start planning the local walk right away. "Something was telling me, 'Do it now,'" she said. "I don't want other parents to go through the same thing. It kicks the light right out of you. I'm not the same bubbly person I used to be." At the first walk, in September 2012, the women hoped to get around 50 participants. More than 250 showed up. This year, 186 walkers came, and the event raised nearly $12,000. The Newport walk is one of more than 300 community walks across the country sponsored by the American Foundation for Suicide Prevention. Half the funds raised go to the national organization, while the local chapter keeps half. A Burlington Out of the Darkness walk is scheduled for October 11. Suicide is of great concern in Vermont, Butler said. And in rural and comparatively economically depressed areas like the Northeast Kingdom, there is even higher risk, she believes. Less than 24 hours after the walk, a man in nearby Eden slit his own throat and died at Copley Hospital. State police tried and failed to stop him. "We have a big problem," Butler said. "I think people tend to hold their feelings in, not talk about suicide, not get help for mental-health issues," she said. Diverse groups showed up for the cause. The Vermont National Guard set up a tent, as did a local family foundation. 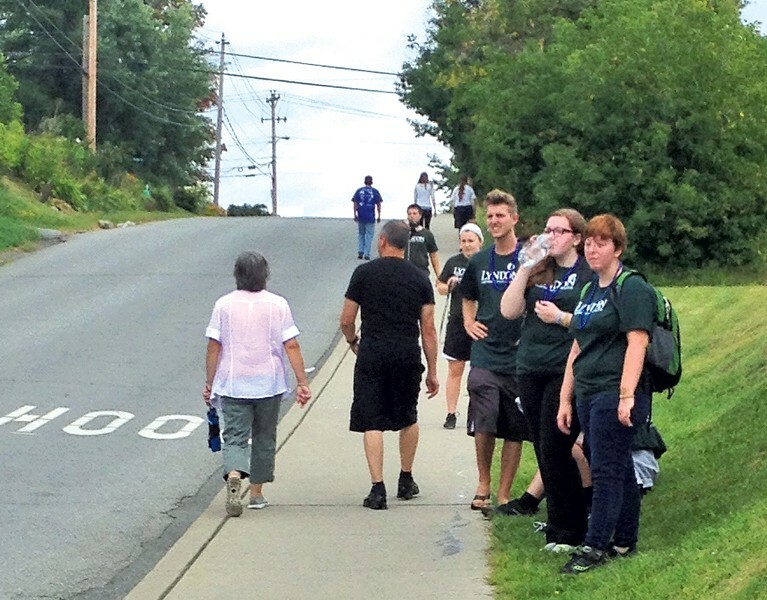 Eleven students, all in dark green shirts, took a bus from Lyndon State College, representing the school's community service club. The beginning and end of college can be a particularly vulnerable time for young adults, they said. "A lot of people in their early twenties feel lost and don't know what to do with their lives," said Beatrice Potter, 19, a sophomore from Swanton. One of her classmates at her small high school took his life soon after graduation, she said. After Marc Bathalon spoke, Butler took the stage and looked out over the small crowd for a final send-off. "We know that many of you are feeling sad, but coming together helps our healing, and we have come a long way in three years," she said. "I wish you a healing journey." Then, to the chirpy strains of the "Colonel Bogey March" made famous by the 1957 movie Bridge on the River Kwai, the crowd set out into the hazy heat in pairs and groups, large and small. As they headed off, Nancy Mitchell of Barton remained seated on a park bench, waiting for members of her family to return. Even though she has trouble walking, she wanted to come to the event in memory of her grandson, who died by suicide as a young man, the same day she had shared jokes with him over the phone. She said she could relate to everything Marc Bathalon said. "What you see on the outside isn't always what is going on on the inside," Mitchell said. "It's nice to look around and know you're not the only one going through it. There are others in your shoes." For help, call the National Suicide Prevention Lifeline at 800-273-8255.